Lenoir holds a secret hiding in plain view: The town, with fewer than 18,500 residents, houses the largest public outdoor sculpture collection per capita in the United States, boasting 77 sizeable works scattered across the landscape. World-renowned sculptor Thomas Sayre is ticking that number up to 78, adding what is now the largest piece: Across the Grain, a circular sculpture of earth-colored concrete that towers at 26 feet and weighs 40,000 pounds. Located at the corner of Harper Avenue and Church Street, the artwork will be dedicated this month during the Caldwell Arts Council’s 27th annual Sculpture Celebration, which highlights the collection and draws artists from across the Southeast for a contest. More than 200 works will be on exhibit at Broyhill Walking Park. 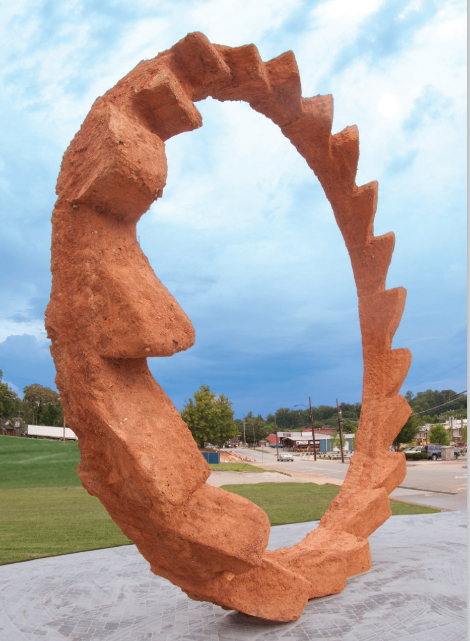 When arts council Director Lee Carol Giduz commissioned Sayre to create a grand work to anchor the town’s collection, Lenoir pulled together, raising $100,000 to cover the costs of materials, landscaping, and complementary educational programming for area school children. Fifty residents volunteered to assist with the process, which was monumental in itself. “Outdoor sculpture should be large because the outdoors is large,” says Sayre. Fifteen years ago, the artist developed a method he calls earthcasting. A design is dug into the ground with a backhoe, so the earth serves as the mold. Pieces cure for three weeks before being raised with a crane. “Across the Grain has everything to do with the history and future of this town,” Sayre says. Its circular form suggests the wheels that have been a part of the area’s history, such as waterwheels that powered sawmills for the furniture industry, as well as mechanisms of the future, like jet turbines, alluding to the growing link between North Carolina and China. Across the Grain will be dedicated September 7 at 3 p.m.